but the page had a funny title and now I can't find it again. Help! I don't think it is doable. 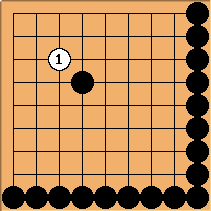 There is some trickyness that black can throw, but in the end white should still live with that much space around the 4-4 stone. The place to start is not the 3-4 point but the 2-4 points. You have to think differently as it is easy to run away along the 2nd line to safety. It is easy to kill in such a position. Andrew Grant: On the contrary, it's not difficult to kill this. in the diagram above is slack. Try at 4 for a start. Thanks, Bildstein. That was what I was looking for. 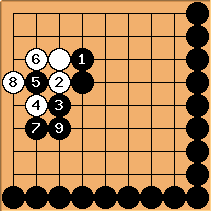 I suppose that giving black the extra 4-4 stone to start with in the 10x10CornerGame1 suffices for an easy kill.